If you like cards (and who doesn’t), you’ll like this poker deck. Each of the 54 cards (four suits of 13 cards each plus two Jokers) has a brief case study and answer. For fun, the Kings are ice climbers; the Queens, skiers; and the Jack's, canoe paddlers. The back of the card features a colorful and updated rendition of the Vitruvian man in our logo. We've already experimented with modifying a number of classic card games to include the case studies (think Go Fish, War, etc.). Staff trainers have been using the cards to review their program's medical policies and train staff by playing a game of Wilderness Medicine "Jeopardy" using the case studies in deck as questions and answers for the game. This strategy works great as part of a staff meeting or an evening session during a field training. 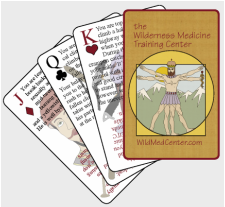 Click here to download a pdf file with game ideas for our Wilderness Medicine Playing Cards.